As you contemplate your Thanksgiving leftovers (after, of course, checking out the Black Friday deals), one of the most popular is turkey soup--you have a roasted turkey carcass with the potential to make a great flavor base for your soup. As you embark on this soup adventure, keep one thing in mind: temperature! Here’s the main rule of thumb: if you want to keep the flavor in the ingredient, put it in a pot of hot water, this will help seal the flavor in. But, if you want to extract the maximum amount of flavor out of the ingredient, then start with cold water and gradually raise the temperature--this will pull the flavor out of the ingredient as the water warms up. In practical application (e.g. 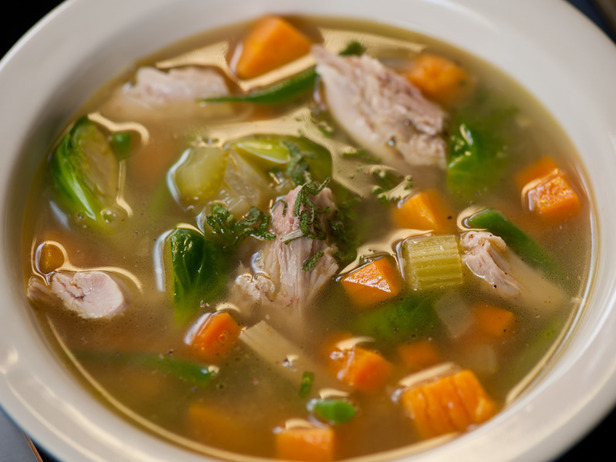 turkey soup), start the cold turkey carcass in cold water and warm it very gradually. If you want to eat some of the leftover turkey meat in the soup, then add this at the end, so the turkey meat will retain its flavor, rather than losing it to the soup. One last note: as the soup cools down, some of the flavor will return to the carcass, so remove the carcass from the soup while the soup is still hot. And enjoy the returns of a Happy Thanksgiving!